Velvet 56 Limited Edition is a 56mm f/1.6 with 1:2 macro capabilities for Canon and Nikon cameras. Inspired by classic portrait lenses from the mid-20th century, this manual focus portrait lens delivers a soft, glowing effect at brighter apertures and beautifully sharp yet subtly unique images as you stop down. The gorgeous, velvety- tones give your digital images a film-like, organic quality. This incredibly versatile lens enables photographers to move seamlessly from shooting an environmental portrait, to capturing the finest details with focus as close as 5 from the front of the lens. 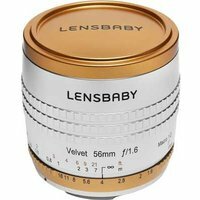 Velvet 56 Limited Edition features copper-anodized accents on the lens cap and aperture ring, off-set by the beautiful clear-anodized finish on the all-metal lens body with engraved aperture and focus markings.